The aim of this study is to establish reading fluency norms for preparatory students, students in first grade and students in second grade. A total of 1056 students in the preparatory class, 1977 first grade students and 1763 second grade students both from the urban and rural areas of different counties of the country were evaluated at the end of the school year using a set of tasks selected from the PEAFC probe. 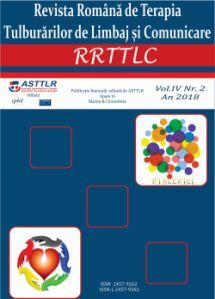 The results offer an overview of the oral reading fluency at the end of the preparatory class, at the end of first grade and at the end of second grade, representative for the Romanian population. Both the reading frequency and the reading errors, the accuracy of reading were recorded. The published norms can be used both by teachers and by language language therapy specialists to identify students at risk to develop learning difficulties and to develop intervention plans according to the particularities of each case. This article focuses on the importance of early intervention as far as language development. This paper proposes an approach which focuses on the importance of the early assessment of toddlers’ language skills development in order to identify possible delays or disorders. Keywords: speech and language development, early intervention, speech delay. The purpose of this research was to devellop lexico-semantic skills of preschool children with hearing disability by creating an intervention program based on stimulating and training verbal language. This article presents a case study regarding Down syndrome and the difficulties that appear due to pragmatic communication disorder in the day to day life of persons with Down syndrome. Having difficulties in the area of pragmatic communication suggests the lack of functional communication, with impact on an individuals social life, human interractions, establishing and maintaining significant relationships, along with having difficulties in understanding speech, waiting for one`s turn, listening, starting, maintaining or ending a conversation. This article studies the particularities of spoken language in students with intellectual disabilities and the importance of a complex language assessment in order to structure a personalized intervention program for speech and language therapy. Hereby language is being evaluated in all its aspects: phonetic, phonological, morphological, semantic and syntactic. Some studies made a connection between mild transmission hearing impairment and the ability to perceive speech rate both led to stuttering. Language acquisition is closely linked to the hearing development. Children with hearing impairments go through the same steps in hearing development as typically developed children do but they need more time to go through each developmental stage. During the intervention programme, hearing must not be dealt with in an isolated way. It is highly recommended that the functions of hearing to be connected with the functions the tactile-kinesthetic, visual, dynamic, olfactory, vestibular ones. The child will be able to develop the capacity of auditory decoding and also the communicative competences as the capacity of hearing is growing in combination with other sensory ways. Keywords: mild transmission hearing impairment, developmental stuttering, speech therapy, fluency disorders,, The Programme of Runyan-fluency rules. In this paper we will study the level of development of morpho – semantic abilities of students with hearing disability, with cochlear implant and hearing aid. The samples chosen for the research consists of 6 students with hearing disability, 4th grade students from the Special High School for Hearing Impaired Cluj-Napoca, three students with cochlear implanted and three other students with hearing aids. To evaluate the morphological abilities I used Morphological Skills Assessment Test in Romanian Language (Haţegan C. B., 2014), and for the assessment of semantic abilities we used the Peabody Vocabulary Test (Dunn & Dunn, 1981). After the evaluations, the results were processed in order to identify the differences between the two groups of students, the cochlear implant pupils and the hearing aid students, the morphological and semantic abilities. Starting from the operational psychological theories on the area of proximal development created by J. Piaget (1965) and L.S. Vîgotski (1971), I sought to change the stage of evaluation and diagnosis of specific learning disorders of elementary school students, from research activity into a research „hands-on” activity, through which evaluation and diagnosis become a complex, dynamic and a long lasting process. The finality of this process has materialized in the ease of developing and applying the compensatory and rehabilitative therapeutic approach that helps young students avoid school failure. Due to the formative character of using the applied psychological tests, by determining the cognitive level and child’s academic skills, I have ruled out the idea of non-training students with certain predispositions for specific learning disorders. From a psychological and pedagogical point of view, such evaluation has a particular efficiency in cognitive stimulation by orienting psychological intervention to improving students’ academic skills. Through early evaluation and intervention, I have brought to parents’ awareness and to the school environment (teachers and students’ school peers) the students’ specific learning difficulties, things that would change wrong attitudes and bad representations towards students with specific learning disorders. This article defines verbal fluency, with both its ways: semantic verbal fluency and phonemic verbal fluency trying to answer to the fallowing question „Is Verbal fluency and indicator for linguistic or a cognitive development?”. In order to answer this question this article mentions lots of researches regarding all the area in which verbal fluency tests are used. Among these areas we can mention: linguistic area, neuropsychological area, psychiatric area. The practical aspect regrading verbal fluency is ensured through the proposed assessment and training tasks both for semantic and phonemic verbal fluency. The way Romanian psychological tests compress verbal fluency is another aspect approached in this article, in order to ensure for the reader, the possibility to have a global image about verbal fluency and its concert materializations. Keywords: verbal fluency, semantic verbal fluency, phonemic verbal fluency, executive functioning, language development.